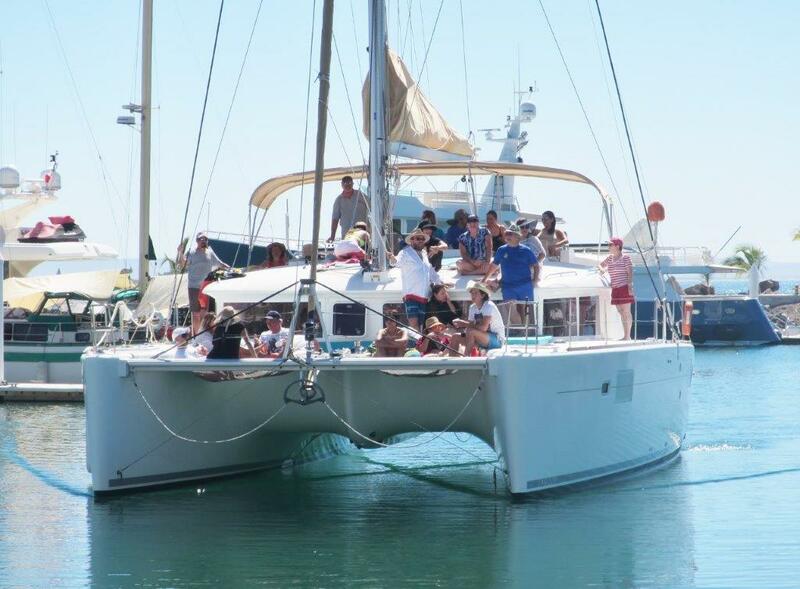 2019 Fundraising Cruise – Fundación Ayuda Niños La Paz, A.C.
For the fifth year Club Rotario members Mike and Cathy McLeod and Club Rotario – Bahia De La Paz will be sponsoring a scholarship benefit for the 2019-2020 school year! You can read about the successful event put on by them in 2018. Details will be revealed soon. Our fourth annual cruise of the catamarans, was a lot of fun! It was made possible by Mike and Cathy McLeod and Club Rotario – Bahia De La Paz, with profits destined to be split between FANLAP (helping children in impoverished neighborhoods) and CONAFE (an organization that builds schools in rural areas in BCS). Last year’s event—a six-hour fun-filled cruise departed on Sunday, May 27, from Marina Palmira’s dock 4 at 10:00 a.m. and returned at 4:00 p.m.
Orion—owned by Club Rotario members Mike and Cathy McLeod—as well as Running Horse (both catamarans) made last year’s event double the fun. The limited-capacity catamarans both had approximately 21 passengers who paid 720 pesos each for the day, and participants could bring and share whatever they wanted to eat and drink. Fanlap’s share of the profits was $15,320 pesos and 210 U.S. dollars and was used in the 2018-2019 school year to fund scholarships.